It’s definitely not a good start for Flipkart this year, as the Kerala State Sales tax department has slapped a fine of Rs 54 crore for sales tax evasion in two consecutive financial years, ie 2012-13 and 2013-14. The fine score card reads the highest fine of Rs. 47.15 crores for Flipkart, followed by Rs.3.89 crores for Jabong, Rs. 2.23 crores for Vector E-commerce (that has a stake in Myntra) and Rs.36 lakhs for Robemall apparels (Zovi.com). The state had banned these e-tailors from enforcing their COD options, but the companies resumed after an insignificant pause. The COD option is the most sought after option for household online buyers. The Kerala state sales tax department after observing many tax evaders, has claimed to re-inspecting every e-tailer’s VAT statement to pull out any tax evaders. The same issue triggered off in Karnataka against Amazon India’s third party vendors, by starting to cancel their selling license for storing Amazon India’s prospective products. These third party vendors then paid the VAT to the Karnataka VAT department after the transaction occurred, which was pretty tangling for the tax authorities. They’d rather have Amazon India pay the taxes for all the goods stored and sold. However, the Karnataka Sales Tax Department didn’t have much to complain about when it came to Snapdeal, Flipkart, Jabong and others who operated somewhat similar to how Amazon India did. It’s not only about tax evading, the state governments want to also start taxing the e-tailers entry tax thereby increasing the ultimate selling price of the products sold. Just weeks back the bank account of Naaptol was made frozen on account of unpaid VAT by the Maharashtra Sales Tax department. The online retailers collectively make sales in crores every single day and surely the state sales departments don’t want to lose out of their revenue by letting the e-tailers pass on discount and evade much of the sales tax to the government. These incidents are now getting repeated at much higher frequency, and Government should step and bring clarity on how and what eCommerce firms need to do. These issues are caused mostly due to the fact that many legalities are still pretty much in gray areas for new age online businesses. 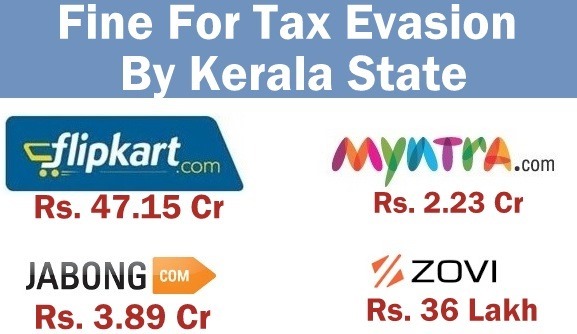 "Flipkart, Jabong & Others Fined Rs.54cr For Tax Evasion by Kerala State", 5 out of 5 based on 1 ratings.